So I've been working a lot more than usual lately. I didn't start my own tomatoes this year (which I've done for the past 7), and because we then decided to move to a larger house, I didn't plant a garden (a few potatoes are all we have - and a whole lot of weeds). We've been buying snacks wrapped in plastic for school and home use. I've also bought single-serving yogurts and pudding. I haven't been thinking about the amount of plastic we are throwing out. And seriously - I noticed the extra in our garbage and recycling. There's lots more waste. Now, this little 2-minute clip didn't send me back into nature-loving plastic-hating mode. A lot of things had been building up and the recycling basket was bothering me. I had noticed that we were getting lax, but this short film was the proverbial straw. The box of 40 Wagon Wheels that we bought at Costco was the second-to-last straw. So when I was at the grocery store yesterday I bought the ingredients to try making my own Wagon Wheels as school snacks. Although loaded with sugar, if you look at the ingredients, the home-made variety shouldn't be as bad as the pre-packaged ones. And my husband and son like their sweets - as do I. I've tried to steer us away from them, but it doesn't really work. Anyhow, I bought Graham crackers, marshmallows and a big bag of chocolate chips. To the latter, my husband thought "Oh ... Honey ... NO!" - I hadn't told him my plans yet (I have a rather pushy chocolate addiction). I started off the adventure melting some of the chocolate chips. Melting chocolate can be tricky. Melt in a double boiler (I use a bowl inside a pot). If any moisture gets into it, it can turn clumpy and dry. If that happens, add a little coconut oil or butter - something with an oil content - and add small amounts until it becomes liquid again. 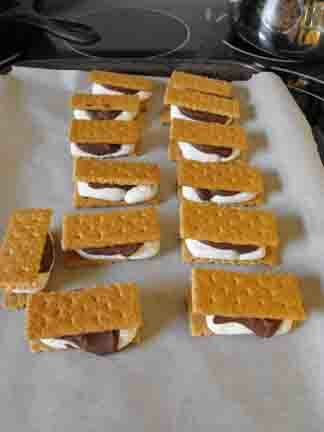 Then I broke the Graham crackers into 4 rectangles (the Honey Maid ones are scored that way), put 3/4 of a marshmallow on top (I put a half a marshmallow - cut in half length-wise - and then a half of a half to mostly cover the cracker 1/4), placed the marshmallows on the crackers under a 400 degree broiler and watched closely until the marshmallows had a lovely golden hue - be careful if you try it, it really doesn't take long - maybe 30 or 60 seconds. After that, I tried coating in chocolate to get the whole Wagon Wheel effect. Well, that was tasty, but it added too much chocolate and made a huge mess. So I decided to go for the S'More effect instead. After all - same ingredients, really. Making these I have a tiny bit more control over what my family eats - and although it's not a plastic free snack (the graham crackers have plastic sleeves, the marshmallows come in a bag and so do the chocolate chips), it is less plastic and less packaging in general (I hope - although I have some doubts) - and the plastic bags this stuff comes in will go to recycling where the individual wrappers on the Wagon Wheels end up in the garbage. I've wrapped them in parchment paper. Some are in the freezer and some in the fridge. I don't know how long they will last before they are gone, but I'm going to try to save them as school snacks. Now, if I get organized, I could probably find all of these ingredients at a bulk store and could take my own containers. Which I might start to do again. It won't be more convenient, but are my convenience and my child's consumption of sugar more important then our planet? I think that's a rhetorical question (or at least I hope it is). We've been told for years that convenience is the way to go. What it does is allows us to make more money so we can buy more stuff that makes life convenient so we can make more money and buy more stuff. Believe me ... I'm part of that cycle. I enjoy my work, I like buying stuff, and I appreciate things that are easy. And doing the easy, convenient things is really easy and convenient. But not for our planet - not for the ecosystem we rely on for our existence. So ... back to doing the more labour-intensive stuff that maybe takes a bit of a load off the planet. I hope.